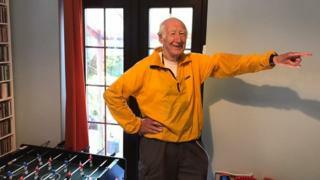 Image caption Laurence Brophy is described as a "fit and active gentleman"
An 85-year-old charity walker reported missing on the Taff Trail has been found safe and was determined to finish his walk. Laurence Brophy, from Pencoed, had not been seen since he set off on his solo trek from Cardiff to Brecon and back on Thursday. South Wales Police had asked walkers to get in touch if they had seen him. He was found by officers on Saturday on the Taff Mead embankment and insisted on finishing the walk. A post on his support page on Facebook said: "He set his phone to airplane mode by mistake. That's why he could not be contacted or contact anyone else." The retired teacher stood as a Green party candidate for the Ogmore seat at last year's assembly elections and has completed numerous charity walking and cycling challenges. He was last seen in Tongwynlais at about 12:00 BST on Thursday, when he set off for the walk, wearing a yellow jacket and dark walking trousers.